Til chikki is one of the easiest crackers you could ever make and it requires no baking. 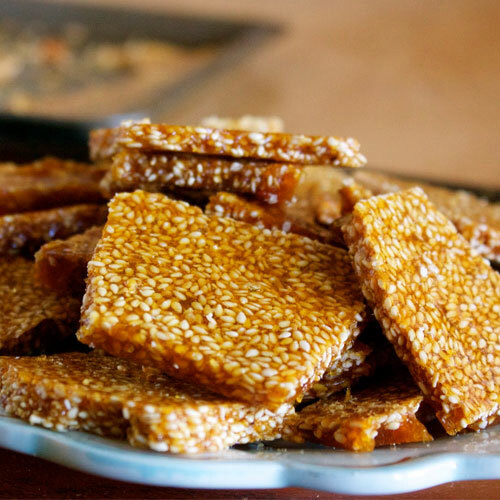 These chikkis are very nutritious because of the combination of sesame seeds and jaggery, both of which are good sources of iron and minerals. Heat a deep non-stick pan, add the sesame seeds and dry roast on a medium flame for 5 to 6 minutes. Remove and keep aside. Heat the ghee in the same deep non-stick pan, add the jaggery, mix well and cook on a medium flame for 3 minutes, while stirring continuously. Switch off the flame, add the roasted sesame seeds and mix very well. When the mixture is ready, put the entire mixture over the back of a greased thali or a smooth stone surface. Roll it out thinly into a 200 mm. (8") diameter circle using a greased rolling pin. Cut them into 38 mm. (1. 5"x1. 5") square pieces using a sharp knife. Allow it to cool completely. Once cooled, store in an air-tight container.